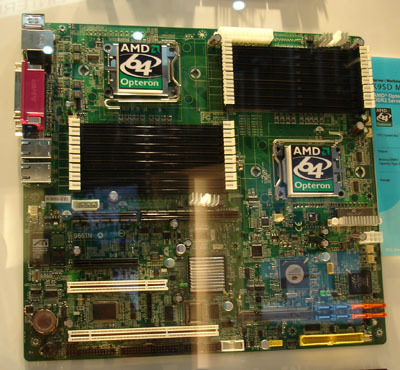 Computex 2006 Motherboards supporting AMD's Socket F infrastructure cropped up here and there at Computex this week, though the chip maker has yet to launch the DDR 2-supporting processor interconnect. MSI's K9SD Master-A8R board is typical: it's designed for a pair of Socket F Opteron CPUs - the info panel said 200 and 100 series parts, but since Opteron 100s are not expected to be offered with Socket F, we assume MSI actually means the 800 series. The board is based on Broadcom subsidiary ServerWorks' HT-1000 and HT-2000 chips, both HyperTransport parts that provide, respectively, RAID 5 support and PCI-X/PCI Express connectivity, and together all the key server I/O components, including Gigabit Ethernet. There's one IDE, four SATA and four SATA II ports on board, and an Adaptec chip to add RAID 10. The MSI mobo includes 16 DIMM slots - enough for up to 32GB of registered 667MHz or 533MHz DDR 2 to be added, in dual-channel configuration. Gigabyte's GA-3AESV-RH Socket 9 board uses the same ServerWorks chips as the MSI product, though it only runs to a total of 48GB of memory. Like the K9SD Master-A8R it has an old ATI chip in place to provide basic graphic support.